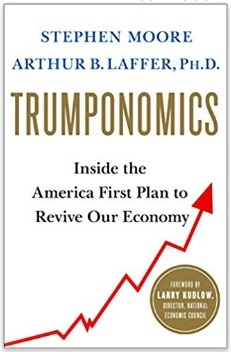 Steve Moore and Art Laffer are the authors of Trumponomics, a largely favorable book about the President’s economic policy. I have a more jaundiced view about Trump. I’m happy to praise his good policies (taxes and regulation), but I also condemn his bad policies (spending and trade). And as you might expect, some people are completely on the opposite side from Moore and Laffer. Writing for New York, Jonathan Chait offers a very unfriendly review of the book. He starts by categorizing Steve and Art (as well as Larry Kudlow, who wrote the foreword) as being fixated on tax rates. The authors of Trumponomics are Larry Kudlow (who left in the middle of its writing to accept a job as director of the National Economic Council), Stephen Moore, and Arthur Laffer. The three fervently propound supply-side economics, a doctrine that holds that economic performance hinges largely on maintaining low tax rates on the rich. …Kudlow, Moore, and Laffer are unusually fixated on tax cuts, but they are merely extreme examples of the entire Republican Establishment, which shared their broad priorities. For what it’s worth, I think low tax rates are good policy. And I suspect that the vast majority of economists will agree with the notion that lower tax rates are better for growth than high tax rates. But Chait presumably thinks that Larry, Steve, and Art overstate the importance of low rates (hence, the qualification about “economic performance hinges largely”). To bolster his case, he claims advocates of low tax rates were wrong about the 1990s and the 2000s. In the 1990s, the supply-siders insisted Bill Clinton’s increase in the top tax rate would create a recession and cause revenue to plummet. The following decade, they heralded the Bush tax cuts as the elixir that had brought in a glorious new era of prosperity. …The supply-siders have maintained absolute faith in their dogma in the face of repeated failure by banishing all doubt. …they have confined their failed predictions to the memory hole. If Chait’s point is simply that some supply-siders have been too exuberant at times, I won’t argue. Exaggeration, overstatement, and tunnel vision are pervasive on all sides in Washington. Heck, I sometimes fall victim to the same temptation, though I try to atone for my bouts of puffery by bending over backwards to point out that taxation is just one piece of the big policy puzzle. Which is why I want to focus on this next excerpt from Chait’s article. He is very agitated that the book praises the economic performance of the Clinton years and criticizes the economic performance of the Bush years. A brief economic history in Trumponomics touts the gains made from 1982 to 1999, and laments “those gains stalled out after 2000 under Presidents George W. Bush and Barack Obama.” Notice, in addition to starting the Reagan era in 1982, thus absolving him for any blame for the recession that began a year into his presidency, they have retroactively moved the hated leftist Bill Clinton into the right-wing hero camp and the beloved conservative hero George W. Bush into the failed left-wing statist camp. Well, there’s a reason Clinton is in the good camp and Bush is in the bad camp. As you can see from Economic Freedom of the World (I added some numbers and commentary), the U.S. enjoyed increasing economic liberty during the 1990s and suffered decreasing economic liberty during the 2000s. For what it’s worth, I’m not claiming that Bill Clinton wanted more economic liberty or that George W. Bush wanted more statism. Maybe the credit/blame belongs to Congress. Or maybe presidents get swept up in events that happen to occur when they’re in office. All I’m saying is that Steve and Art are correct when they point out that the nation got better overall policy under Clinton and worse overall policy under Bush. In other words, Clinton’s 1993 tax increase was bad, but it was more than offset by pro-market reforms in other areas. Likewise, Bush’s tax cuts were good, but they were more than offset by anti-market policies in other areas. P.S. Chait complained about Moore and Laffer “starting the Reagan era in 1982, thus absolving him for any blame for the recession that began a year into his presidency”. Since I’m a fan of Reaganomics, I feel compelled to offer three comments. First, the recession began in July 1981. That’s six months into Reagan’s presidency rather than one year. Second, does Chait really want to claim that the downturn was Reagan’s fault? If so, I’m curious to get his explanation for how a tax cut that was signed in August caused a recession that began the previous month. Third, the recession almost certainly should be blamed on bad monetary policy, and even Robert Samuelson points out that Reagan deserves immense praise for his handling of that issue. P.P.S. Bill Clinton’s 1993 tax hike didn’t produce the budget surpluses of the late 1990s. If you don’t believe me, check out the numbers from Bill Clinton’s FY1996 budget.